We have such an emotional connection to our hair; a ‘bad hair day’ can have such a big impact on our attitude and outlook, while a ‘good hair day’ makes everything else seem much more rosy. Although a trip to the hairdresser is supposed to be fun, indulgent and relaxing, the anxiety we often feel at the thought of some unknown creative taking a pair of scissors to our barnet is real. Choosing a great hairdresser is a fundamental part of the process; for some it’s as intimate as picking a gynecologist or masseuse – because you’re putting your trust in their hands to make the next three months of your life bouncy and stylish. If that goes wrong there could well be tears… And hats. I’ve had my fair share of horrendous experiences over the years, but equally have found some amazing stylists along the way who I completely trust with my split ends and grey roots. While sitting in a salon chair a few weeks ago I started to reflect upon what makes a good experience and what makes a bad; sometimes we all need a little push to switch things up a bit and find ourselves a hairdresser that will fulfill all our wildest dreams. Here are the ten signs you need to find a new hairdresser… Because there’s no better time to try something new than a new year. Half the reason we pay a small fortune for a stranger to cut an inch of our hair is because we want to be made to feel incredibly special – even for just a couple of hours. If the stylist in question doesn’t make you feel like the most important client he’s ever had, then what’s the point? Showing an interest and engaging in conversation is vitally important; remaining silent and only conversing when essential is just not cool. There’s nothing worse than looking around a salon and seeing that everyone looks like they’d rather be somewhere else. If you don’t want to be here, then why would I? It ruins the whole experience if members of the team are looking like their cat just died, hanging around looking messy. If you want to be miserable, go to the staff room where your paying customers can’t see! Although there’s a growing trend of hairdressers saying ‘you wouldn’t tell a doctor how to do his job, so let me just do my thing’, it’s just not practical. We’re the ones that have to leave the salon and love our look, re-styling it every single morning; involving us in that process and understanding what’s practical, realistic and workable will ensure a much happier customer. Building on the previous point, there’s nothing worse than asking for no layers or ‘only an inch off’, to be presented with a Rod Stewart-esque ‘do at the end of it. I’ve left salons almost in tears before, when they’ve compeltely ignored my pleas and ruined six months worth of hair growing to get everything the same length. Half the enjoyment of popping to the salon on a Saturday afternoon is a cup of tea, magazines on tap and time out from the world. Leaving a client on the backwash for an hour while their colour develops is really bad customer service – and horrendously awkward for our necks! Just don’t. I’m all for salons making a few extra bob on refreshments, but don’t make me pay £4.00 for a cup of tea and then drag me away just as it reaches optimum temperature. I would pay significant amounts for their to a re-heating service in my hairdressers. Nobody likes a luke warm English Breakfast. A huge bugbear of mine… What’s going on in your phone that’s more important than my hair? Put it away until I’m gone! Reiterating my point about making you feel special, checking Twitter or texting your mate about post-work cocktails isn’t appropriate while you’re on the salon floor. When they spray so much hairspray that you need an inhaler (when you don’t even suffer from asthma,) then you know it’s a problem. Using styling products sparingly is much more effective and leaves clients feeling like their hair is swishy – rather than a lego cut out. It makes me feel nauseous, plus I spend the whole journey home combing through my hair with my fingers in an attempt to make it look normal. We all know time is precious when you’re working with people (and inevitably running over your allotted time,) but literally walking from one station to the next makes us feel like we’re on a conveyor belt. While waiting for my colour to develop recently, I watched as stylists were treating clients like they were tasks on the Generation Game; it made me feel a bit sad and wondered why they didn’t just take some time to walk on client out and another in. Sometimes the little things make all the difference. When we’ve just forked out hundreds of pounds on a new ‘do, a little courtesy walk to the front desk and a ‘cheerio’ is surely part of the basic service? Leaving a lasting positive impression is a sure fire way to get that client to come back, but letting us totter off with a slightly confused and disappointed face will see us searching for an alternative. Have you ever visited a salon where you’ve experienced any of the above? 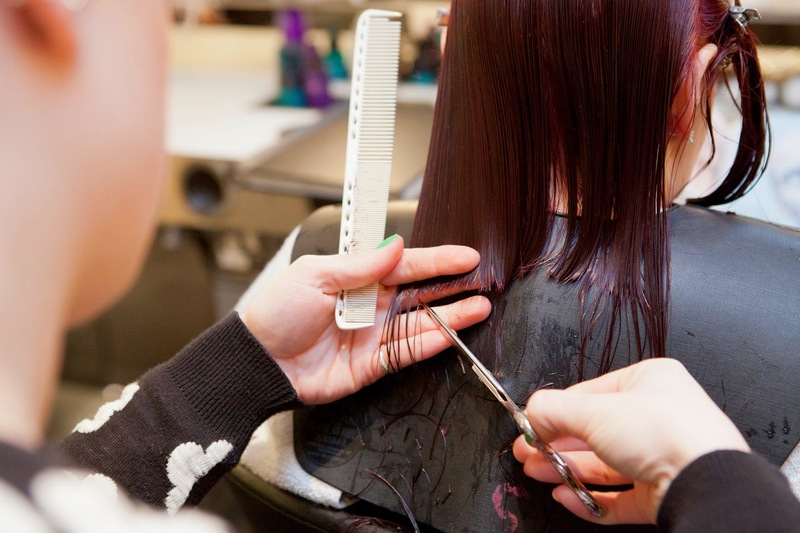 Has it made you switch to a new hairdresser, or are you guilty of just putting up with it? I've been with the same stylist for 5 years. If her next client is early she encourages them to sit close by so they can talk through my entire appointment. There is a waiting area with a sign that says, "wait until called". Am I asking to much for her to hold off on the chit chat while she's cutting my hair? I feel she gets distracted and doesn't always give me a good cut. I was waiting at a barbershop once to get my son's haircut and the barber was cutting someone else's hair and stopping every minute or so to text on his phone. There were at least 3 other people waiting for haircuts and a full shop. I left and never looked back. For me though, #1 is huge because I get my hair braided all the time. Yes I know my hair is thick and there is quite a bit of it, but if someone is complaining about my thick hair and I hear them, that's it for me. I'm very cautious about new hairdressers because of that. Lack of professionalism is a major pet peeve of mine.